40-50 pound tippett is recommended for general use in the Amazon. This will handle just about anything you will encounter. There is really no need for a tapered leader, a straight piece of tippet will do the trick. Peacock Bass have very large and abrasive mouths, even though they really do not have teeth. Much like a Largemouth Bass at first site but much tougher. If you try to lip these fish they will tear up your fingers. We have leaders for sale for our anglers for $4.00 each. We recommend you have 10 leaders with you for your trip. Seaguar fluorocarbon in 40 pound is a great option for streamers. It is very abrasion resistant. Fluorocarbon breaks through the surface of the water and will sink much better than monofilament. Start with about a 6 ft. piece and tie a perfection loop on one end. Loop that to the loop in your fly line (this makes it easy to change leaders). You can fish the leader down to about 3-4 feet and then start with a new 6 ft. piece. 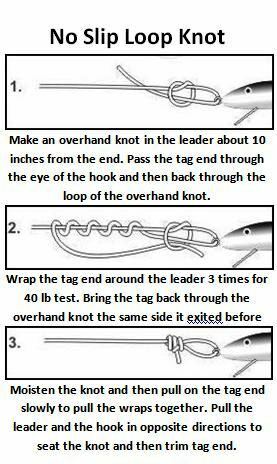 The open loop knot is a great way to tie your leader to your flies. This will give them more action and the knot is very strong. 30-50 pound monofilament is best for top water depending on the size of your flies. Mono floats much better than fluorocarbon and will keep your Top Water flies floating high. You should start with about a 7-8 foot piece and make a few casts. Top Water flies are much harder to cast and require a little more patience. If you are having trouble then shorten your leader to 5-6 feet and try that. Note: If you are using a 3/0 or 5/0 Pole Dancer try using a piece of Fluorocarbon as well. Sometimes it will help keep the fly down a little and it will have better movement.